I can't tell you how excited I am about sharing this recipe with you. This is one of my favorite desserts! 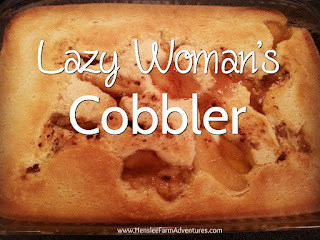 This recipe comes from my grandmother, but don't let the name of the recipe fool you, she was anything but a lazy woman! What I love about this recipe is how quick and easy it is! And sometimes, that is what you need. In fact it is one of those recipes that you can quickly put together if you have surprise company come. The great thing is that they will think you spent a lot of time on this one. So without further ado...the ingredients are all staples that you probably have in your pantry. For the topping or filling, you can use any fruit or pie filling you like. 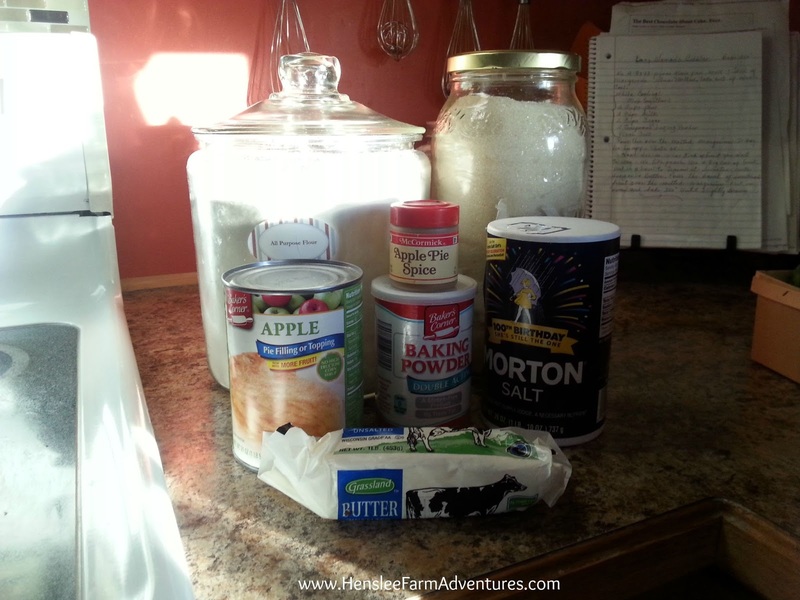 My favorite is to use apple pie filling. My mom likes to use a can of peaches that she spices up with a little cinnamon and nutmeg. Whatever you choose, you really can't go wrong. The first thing to do is to get that stick of butter and melt it. But you want to do it the easy way. While you are preheating the oven to 350°F, put the butter in your 9x13" pan and let the oven melt it for you. 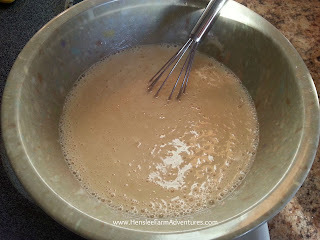 Next, you want to mix together 2 cups of flour, 2 cups of sugar, 2 cups of milk, 2 teaspoons of baking powder and a pinch of salt to make your batter. 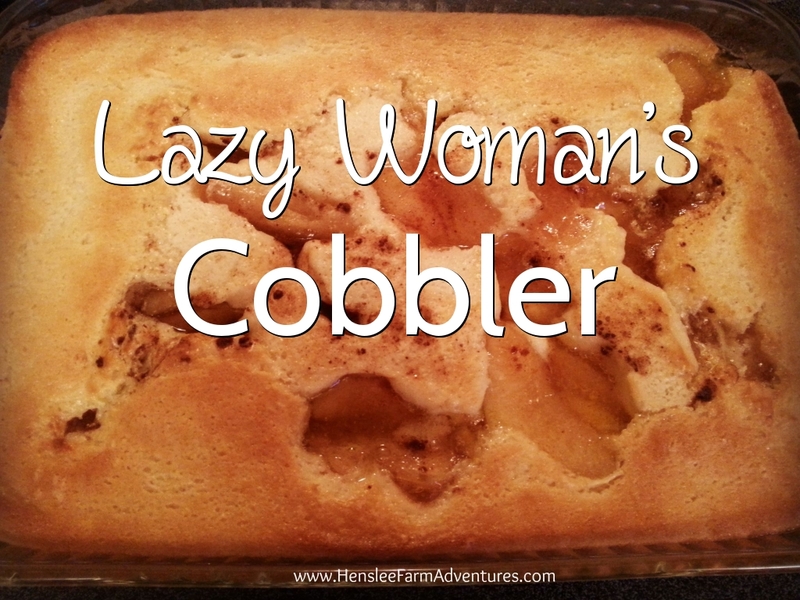 This cobbler has a cake-like consistency rather than a pie. Which is probably why I like it so much! Once your butter is melted, pour the batter right in the pan with the melted butter. 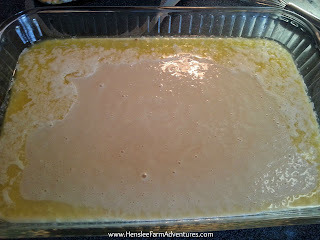 Batter swimming in a sea of butter...yum! Then you can add your fruit or pie filling. Like I said, I love to use apple pie filling. The only other thing that I add is a little bit of apple pie spice on top. 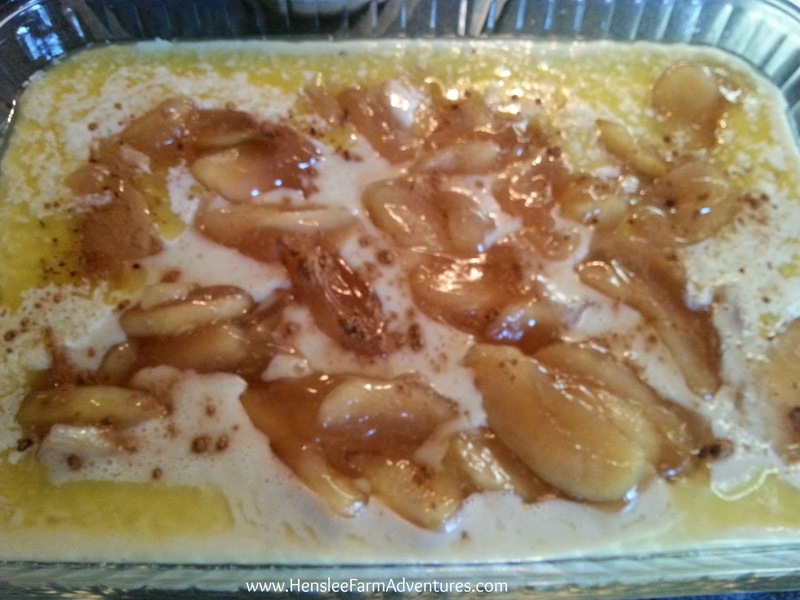 Then bake in the preheated oven for around 45 minutes or until golden brown. All it needs is a little ice cream! Once you dip into this you get a cakey, fruity goodness that just can't be beat! It is so good warm and a little scoop of ice cream on top. So try out this recipe and let me know what you think of it. Let me know in the comments below what your favorite fruit would be to use with this recipe. Cherry would also be great, but I have another recipe that uses cherry pie filling to make a Cherry Slice Cake. That post will be coming soon! And of course, to get the printable version of the recipe, click HERE.